There is a lightness in your step and a broad smile on your face as your eyes gaze upon the glorious equine being who is moving in harmony with you. A flush of heat moves from the core of your heart and the expansion takes your breath away. Finally, after all of your seeking, you have found the experience with Horse that you have been longing for… the sacred dance of intimacy and connection. You continue to flow with grace and ease, your equine companion astutely in-tune to your every move. At the end of this dance you are filled with reverence, you are humbled; you are filled with an energy that could light up the world a thousand times over. In this Dance with Horse you have found liberty, a freedom to move, to be, to connect, to follow the flow as it divinely transpires between you and your partner. Through your strength to be vulnerable, to explore and to take risks, you find an inner freedom and courage you had not resourced before in your life. You will never see life the same again. 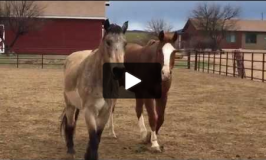 The Dance with Horse program is beyond horsemanship, it is beyond asking horse to heal you. Instead, it is a joyous celebration of interspecies communication and connection. The Dance with Horse program is designed for the individual who is ready to experience a sacred level of engagement and flow with Horse. You will be taken through several creative explorations that will help you ignite confidence, clarity and pure joy at liberty with horses. Just as animals in the wild find ways to court, mingle, touch, jostle and commune, you too will learn the art of an intuitive relational dance. The Dance with Horse program takes you beyond your currently interactions with Horse to an entire new area of play, exploration and joy. Horse is a river of energy and you learn what it means to truly flow. Be part of this extraordinary experience with Kathy’s masterful herd of horses that have been dancing with her for years. Learn not only the easy steps, but also how to let your energy flow and open up your entire body to the gift of mutual admiration. Each day will be filled with hands on experiences to open up your energy field to the dance. You will receive ample opportunities to work directly with a horse to develop your ability to attune to the nature of horse and instinctively find mutual partnership. By the end of the week you and horse, with music, will find what is perfect and divine in your partnership. Dance with Horse covers energy management, reading the horses’ communications, timing, intention and flow, and a non-dominant approach to communications. You learn to be open and receptive to create deeper levels of connection. Horses are provided for this program and are safe and confident in their interaction with humans. You may also bring your own horse. Horses are provided. Program has limited space to ensure quality experiences. Register early to reserve your spot. Experience private instruction with Kathy during a VIP day/retreat. 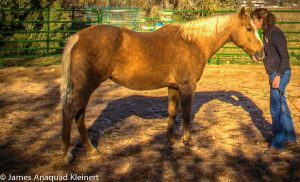 Kathy’s masterful herd of horses will guide you to places you have yet to experience during this one-on-one experience. You may also book to stay at the ranch in a private cottage with a full kitchen and all amenities. One-day VIP session is $850 (no lodging). One-day VIP session is $1,150 and includes a two-night stay at ranch. Two-day VIP session is $1,800 and includes a two-night stay at ranch. Three-day VIP session is $2,600 and includes a three-night stay at ranch. Click Here for more information about the EFLC Level One program.